It's almost TGIF! Yipee!!! Days pass by so quickly I sometimes forget what day it is. I was thinking it's still Tuesday. I just didn't notice that Wednesday passed by already. Anway, my Tukayo left me a note about these little sumthin' sumthin' she has for me in her Lair...and here they are. First one is the 'You Make My Day Award'....have not received one like this before so I'm pretty excited to get it. Thanks Tuks. 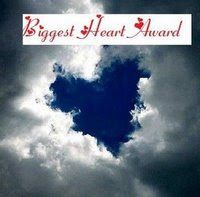 This second one that Tuks and Mommie Emma handed me, the "Biggest Heart Award", was handed to me by my cyber bwader Denz a couple of days ago. I posted it already then but I am posting it again. May reklamo??? Didn't think so...hehe...Thanks again, Lucel Juliana and Mommy Emma.